Back in another life, I was a romance editor. Technically, I guess I still am, on the side. This magnet was from one of my authors like 10 years ago already. 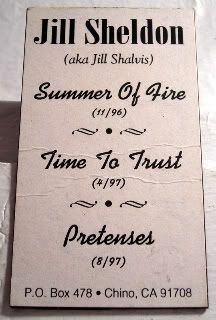 She pubbed these titles with a different publisher at the time, and had these promo magnets made for herself. Lots of authors create their own little promotional items - and if it weren't the middle of the night, I'd wax poetic about how it's because publishers just don't have the bandwidth or the budgets to promote each of their authors as they should, leaving authors to have to work harder to get their own names out there. Actually, I'm always fairly impressed how astute authors are at marketing themselves - updating their websites, monitoring their fanboards, sending out newsletters, independent signings, or exhibiting at conferences. Sometimes? What they do on their own, ends up showing up any work that any promotional agency or publicity team can do for them. Case in point - next time you're at ComicCon, check out Sherrilyn Kenyon - this woman's like the juggernaut of marketing. It's freakin' awesome. I haven't read her, but after seeing the woman's booth and seeing her superdupergigantor banner at ComicCon, I swear, I want to start. Anyway, I've lost touch with Jill, but happily, she's still as prolific as ever - she has a new series out, about a high-end airline and private airport. Think Wings meets Hotel Babylon. I know, right? And yet somehow, it works. Should've taken a picture of Sherri's booth! Yep. Actually, I was more bowled over by the book towers...and how fast they were rebuilding them. Amazing!